During September 1982 Vivian Lynn held an exhibition at the Janne Land Gallery which raised issues, problems and controversies that inevitably emerge when old stereotypes are challenged and an alternative view of human experience is presented. Instead of striving to meet the requirements of a male system, Lynn reflects the priority of serious women artists in staking their claim to be truly themselves in their work. If in doing so the enormous backlog of pre-conditioning in our expectations of what art should be is threatened so much the better. Her efforts may contribute towards the balance between the sexes being more satisfactorily adjusted. Guarden Gates comprises a series of seven works which, although deeply personal and autobiographical, have been likened by the artist to the Stations of the Cross. Bearing titles such as Sacrifice, Unveiling and Rebirth, they evoke a type of spiritual growth or journey. Complex in meaning, on one level they describe a woman's response to the primal forces of the unconscious and its ability to retain information (as clarified by Jung) and on another they describe her conditioning within a patriarchal society and her eventual shedding of this persona. For Lynn, constructing these works over a period of two months was very much a process of 'opening up the self'. Most of the exhibits are made of uniform pairs of cyclone gates which act as a matrix for lengths of human hair. These run ziggurat-like through the wire-netting,' or are plaited and caught at the end with a length of red binding; some tresses are bunched together while others fall freely. The gates hang slightly out from the wall to allow for an interplay of shadow with form. 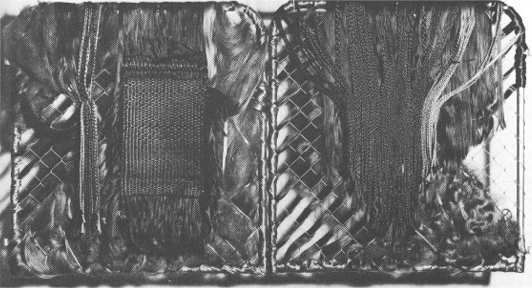 In one instance unbaked clay incorporates the hair and gives the appearance of a dried animal hide; while in another, bags made of black fibre netting encase the hair. Since the beginning of 1982, Lynn has used hair as the chief agent for presenting her ideas. She acknowledges it as being a highly emotive substance, and her investigations into ancient myths have shown how often it was used in the past to illustrate the corrupting influence of womanhood. For example, Lynn explains in notes accompanying the exhibition, 'When Milton in Paradise Lost writes of female hair as "Wanton ringlets wav'd", and "the close embrace of those twining vines", he portrays a female power that may ensnare and destroy'. The first of Lynn's hair constructions was Hair Trigger, shown as part of the artist's survey show at the Wellington City Art Gallery in February. It was essentially a series of rectangular panels laid on the floor on which a cross-section of hair types was placed. At the time Lynn was mainly engaged in exploring the potentialities of hair as an art medium. Coinciding with this installation, the National Art Gallery commissioned a Self-Portrait from her for the exhibition 'Me by Myself'. This comprised a length of artificial hair reaching from the ceiling and threaded through yellow plastic tubing resting on a finely cracked clay base. One was struck by the sensuality of glowing hair contrasted with the inert plastic material. 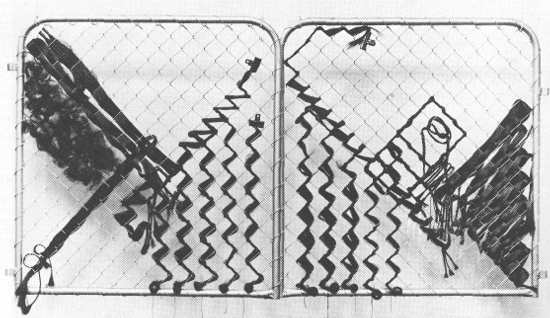 In the Guarden Gates series a similar duality is presented between the standardised forms of the `metal gates and the organic and rhythmic patterns of hair. 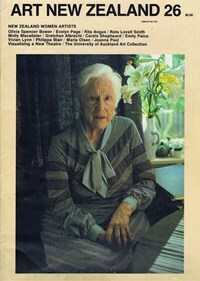 From 1978 to May 1982, Lynn worked on an environmental sculpture called Taupatauma which took the form of a garden at the artist's home. The title of her present series of constructions derives partly from this project: but more to the point she had produced drawings in 1968 which were completely abstract and based on pencil grids over which organic forms were painted in watercolour. The concept of these drawings, based on a formalised pattern (the grid) on which a free form is organised, has now reached fulfilment in the powerful statements of Lynn's Guarden Gates, which are, above all, expressions of female cultural experience.